While having a cup of coffee in the conservatory during breakfast, I noticed a pair of snails, one of them with its genital pore a bit everted. Aroused snails! It was 10:09. I quickly finished my coffee and came closer. Despite coming across tens (hundreds?) 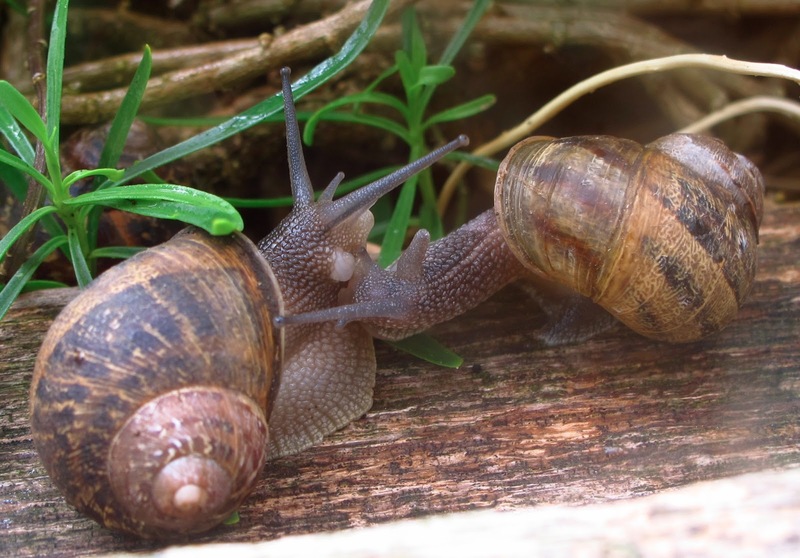 of slumbering mating snails for years, I had never witnessed the actual preliminaries of it, which was now taking place just behind the conservatory glass, on its wooden frame. The series of events was fascinating, by its slow, but surely developing tempo, its tactile nature, its synchrony, and the dance-like quality of it. First the snails approached each other, with their heads up, appearing to avoid exposing their gonopore (an opening behind the right hand side of their heads from which their penises emerge and where their vaginas open) to their partner, while at the same time touching each other's gonopores with their mouths in long, slimy kisses, and tentacles touching, occasionally retracting their heads. One of the snails appeared more keen, while the other regularly turned round and then back, each time coming closer to its partner. Then courtship became more intense, both snails everting their penises and aligned their bodies toward each other, exposing their right sides to each other. Finally, after a couple of hours, they were sleeping in their copulating embrace, and their eyes retracted. I missed the darting and I couldn't see any protruding darts. Here is a slide show. Every now and then, I checked on the snails. They slept on the frame of the conservatory most of the day (at 16:45 they were still mating). I just checked (21:40), and only one remains. The duration of mating in this species is about 7 hours. I have uploaded a video with an early and a later sequecing of the courtship. No matter how long you've been acquainted with a particular species, there is always something surprising and wonderful you might still witness. Thank you for the link George, an amazing film. It does show nicely the differences between Helix pomatia (in the microcosmos film) and H. aspersa. H. pomatia have this 'whole foot contact' which I didn't observe in aspersa.